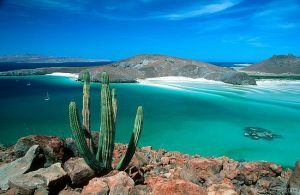 Yachting along the Baja Peninsula in Mexico’s Sea of Cortez is an exotic adventure of contrast and discovery; scorched deserts and cobalt seas, vibrant towns and frontier lands. Underwater, an astonishing variety of species cavort, frolic and thrill everyone on board, whether passive observers, deep-sea divers, or avid sport fisherman. From the sandy shores, the arid landscape of jagged, desert mountains, copper canyons, tumbleweed and cacti, conceals endless surprises. As you parallel the coast, suddenly a burnished landscape gives way to an oasis; a colonial mission, a sun-baked village, an exclusive resort, and then reverts to wilderness. 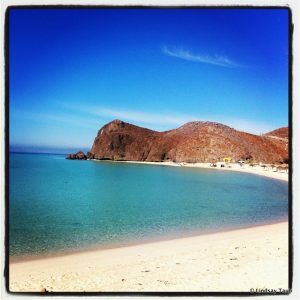 Baja will tantalize those of intrepid sprit, captivate enthusiasts of culture and cuisine, and transfix lovers of nature. 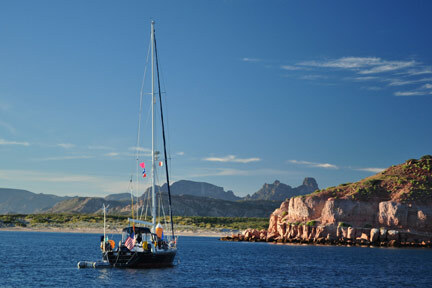 Embark on a yacht charter in Baja California and discover a world that is wild, foreign and full of life. Arriving by yacht, an expansive waterfront promenade is your introduction to this bustling town of markets, museums, historic sites, open-air cafes, and superb restaurants. This is the regional capital, a commercial and political center that still retains a provincial atmosphere. Take an early morning stroll to poke around the shops, galleries and cafes along the malecón. Dingy across the harbor to El Mogote, a sandy peninsula that offers excellent bird watching and beach combing. Dine on Armando Montaño’s irreverent Mexican fusion cuisine (with kid’s menu) at Café Corazón. End the day with a performance at the university theatre. For the ultimate in spa treatments or a round of golf, dock at the CostaBaja Resort Marina and indulge. The uninhabited island of Espiritu Santo, once the hideout of notorious pirates, is a tranquil escape of long white beaches, red volcanic rock and turquoise waters. There are dozens of lovely bays, rich marine life and land-based reptiles, birds, jackrabbits and ring-tailed cats. 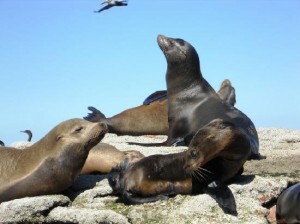 Drop anchor and plunge off the aft deck to snorkel or swim with sea lions, manta rays and dolphins. 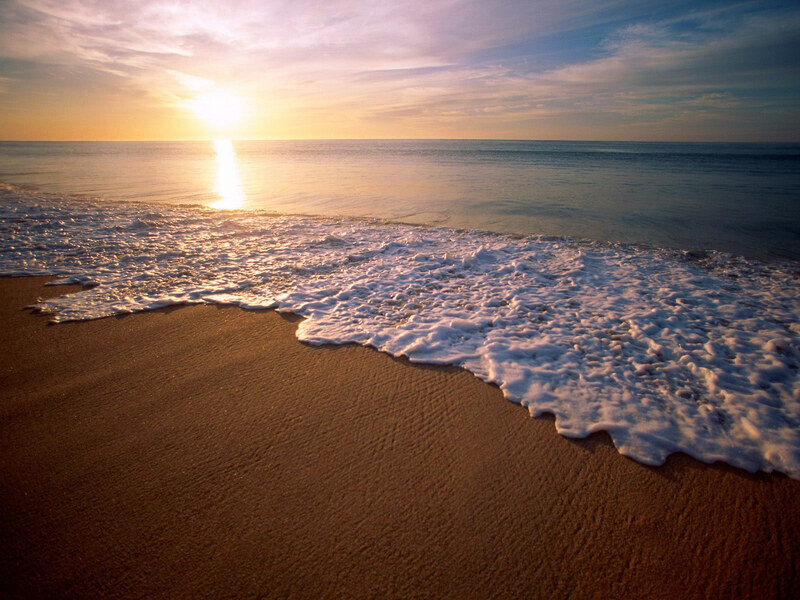 Launch the kayaks or search the beach to find exquisite shells, or a lucky pirate relic. Suwanee reef is ideal for beginning divers. Nearby, a 295-foot shipwreck is thick with black coral, parrotfish and groupers. 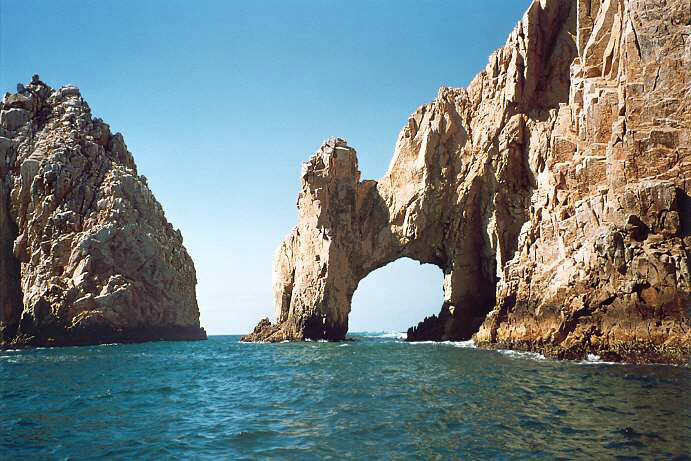 Isla Partida, separated by a narrow isthmus, is fascinating to explore, both above and below the water. A pristine beach offers the perfect opportunity for a private picnic laid out by your crew, and seriously competitive beach games immediately followed by the traditional afternoon siesta. Near the Island of Espiritu Santo, colonies of tuna fish, giant Pacific stingrays, octopus, hammerheads and morays prowl the depths. 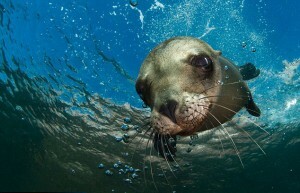 El Bajo is a favorite site of underwater filmmakers, guaranteed to capture the beauty and abundance of the deep. West of the Island of Espiritu Santo, Isla Ballena has three different areas renowned for scuba diving. Visit underwater caves, a sensual sand floor with a garden of conger eels or a beautiful, protected reef with a sunken ship full of fish and corals. This island is a spectacle of thrusting rock formations, the chosen home of hundreds of sea lions. Different water depths make this an ideal destination for charter groups with varied interests and skill levels. There are gentle shallows for swimming and snorkeling, and scuba diving at depths of 105 feet, to view colonies of silvery sardines, royal blue and gold angelfish, conchitos, and amazing corals. Clarity makes Los Islotes a superb spot for photography. Capture friends, family and playful sea lions on shore, then don your gear and dive in to photo and video the extraordinary underwater world. Edit both together for a priceless remembrance of your charter vacation. Isla San Francisco’s half-moon bay lies 44 miles north of La Paz. Once the home of gold miners and pearl hunters, steep rocky cliffs are a beautiful backdrop to this protected, sandy anchorage. 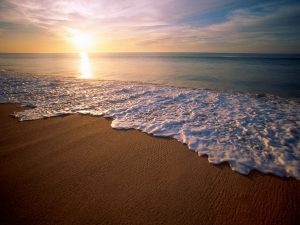 Anchor in 20 feet of water with humpback whales dancing offshore, and a white sand beach ahead that stretches on and on. Trails crisscross the island. Take your camera and a two-hour walk above the anchorage. The reward is a panoramic view of the landscape and the southern beach, hundreds of feet straight below. The east side of the island offers some excellent snorkeling and shallow to moderate dives. At nearby Isla San Jose, anchor in Bahia Amortajada on the south end of the island. Explore the Cardon Cactus forest and lagoon. Bird watchers will be amazed by flocks of ibis, egrets, herons and other species. This is an awesome spot to launch the kayaks, or for those that relish speed, Jet Ski around the sixth largest island in Mexico. San Evaristo is nine miles across the channel on the Baja Sur mainland. Deep blue skies, emerald waters and the color-washed desert landscape are breathtaking. This unassuming fishing village has cheerful, friendly locals that make the humble surroundings most appealing. Waterfront shacks are the center of activity, where fisherman move their catch onto pick-up trucks bound for the markets of La Paz as a part of the fish co-op. A sweeping beach lines the cove and is a lovely setting for an afternoon barbecue. Cruising between San Evaristo and Agua Verde there are gorgeous mountain views and several interesting anchorages. Stunning Los Gatos is a picturesque little bay, great for hiking, snorkeling and scuba diving. Take a short hike to view Pre-Columbian cave paintings and bathe in natural hot springs that are still relatively unknown. Sierra de la Giganta mountain range soars above Puerto Escondido some 4,000 feet, a spectacular backdrop to many protected anchorages. 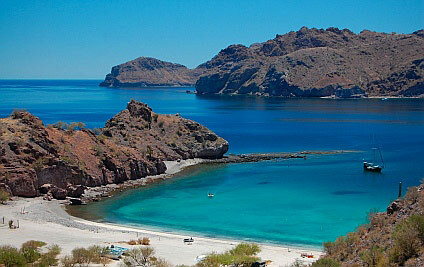 The village lies within the Loreto Bay National Marine Park, a United Nations World Heritage Site. The harbor is a popular yachting destination surrounded by islands and islets with excellent diving and snorkeling. Fish for yellowtail snapper, tuna and grouper year around, with seasonal marlin and sailfish a thrill to the sport fisherman. The gentle surf in the bay is great for paddleboards, kayaks and water skis, and perfect for beginning wind and kite surfers. Rugged trails through the Sierra will challenge the intrepid. Locals rarely fish Isla Santa Catalina and Isla Monserrate, within the park boundaries, so the catch is plentiful. Golf and tennis are available in Loreto, 15 miles to the north. Charter a yacht in Baja California Sur and bring home memories of cobalt waters, playful dolphins, sea lions, and majestic whales, of spectacular reefs and endless beaches. Remember the breakfasts on deck, bathed in the red light of morning, full of anticipation. The end of another spectacular day, dining on your fresh catch and toasting the sun as it slipped behind purple mountains. 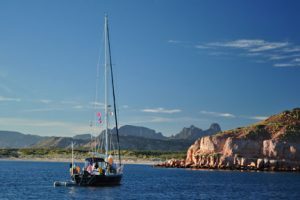 Of all the reasons people fall in love with chartering in Baja, the greatest of all is the promise of endless discovery. You should be in this moment. All the places are very beautiful and perfect destination for the tourist to explore our tours special i will try to visit these places thanks for posting and keep posting good stuff.